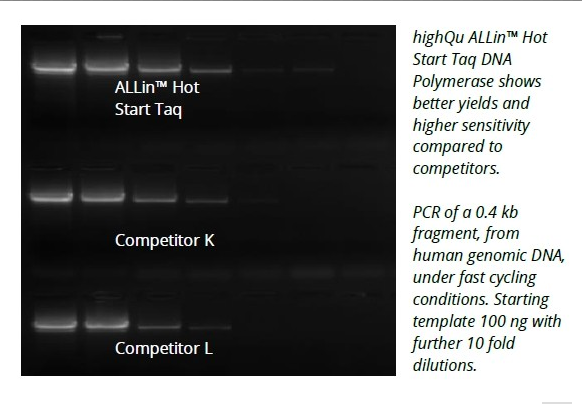 ALLin™ Hot Start Taq Polymerase is the superior sensitive hot-start DNA polymerase. 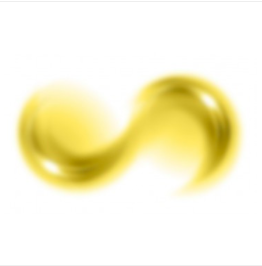 The enzyme activity at room temperature is blocked by a small molecular inhibitor. 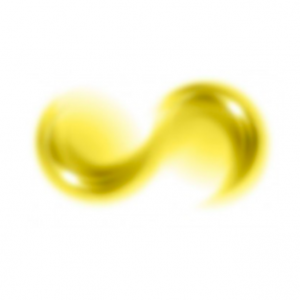 Enzyme becomes active only after heating what allows for highly specific and extremely sensitive amplification, no primer dimer formation occurs and no background appears. In combination with the optimised ALLin™ buffer enzyme provides higher success rates in demanding PCR applications like amplification of complex or longer templates and fast cycling. 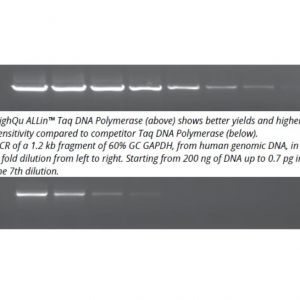 ALLin™ Hot Start Taq DNA Polymerase has the same PCR accuracy like Taq DNA Polymerase, 4.5 x 104 (nucleotides incorporated before the error occurs) and produces A-tailed products suitable for ligating into TA cloning vectors.